Item is the original patent (#22351) granted on September 2, 1885 by the Commissioner of Patents, Dominion of Canada, to George Eastman and William Hall Walker of Rochester, NY, for "improvements in roll holders, for exposing flexible sensitive photographic films." Item includes textual specifications and diagrams of the proposed improvements. Prior to patenting the innovation in Canada, Eastman and Walker were granted a similar patent (#317049) by the United States patent office on May 5, 1885. 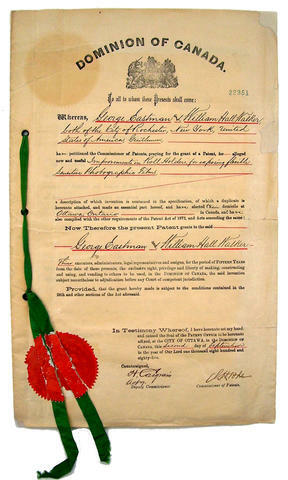 Signed by George Eastman and William Hall Walker and witnesses, H.G. Philips and G.E. Sherry. For detailed Canadian patent description and images, see: http://brevets-patents.ic.gc.ca/opic-cipo/cpd/eng/patent/22351/summary.html?type=number_search.